Abdulrahman (second from left) and Al Shaikh shake hands on the deal as other officials look on. gulfBID and its two parallel exhibitions gulfInteriors and Gulf Property Show will be held from May 12 to 14 at Bahrain International Exhibition and Convention Centre (BIECC). While KMC Holding, owner and manager of turnkey solution companies across the Middle East, will support the gulfBID exhibition, Inovest, a leading Bahrain-based sharia-compliant investment company, will back the Gulf Property Show. Fadi Al Shaikh, KMC Group deputy general manager, said: “gulfBID exhibition provides a platform for us to share our business vision and direction, demonstrate our commitment to our clients, partners and industry in general. KMC was established in 1996 for managing real estate projects and contracting by its ultimate beneficiary Kuwait Finance House (KFH), a leading financial institution in the region, and today KMC is KFH’s project delivery arm, offering a total solution package. Central to Inovest’s presence within the property show is one of its key project companies Durrat Marina. Durrat Marina is a sophisticated, state-of-the-art project, distinguished as the Middle East’s first mixed-use marina development. Inovest has a substantial portfolio of projects that cross several industries; the company’s forays into real estate investment are delivered hand in hand with its primary subsidiary Al Khaleej Development Company (Tameer), said HCE. The company has delivered several notable residential, commercial, and industrial real estate-based projects in Bahrain including the likes of Tala Island in Amwaj, the Bahrain Investment Wharf, Takhzeen, and others. Speaking about the strategic partnership with HCE, Inovest’s interim CEO Mohammed Alnughaimish said: “Inovest is driven by a determination to be a market leader in investment by maintaining a strong commitment to developing and delivering lasting contributions to the socio-economic well-being of the communities we serve. gulfBID is a specialist regional construction and building materials exhibition for the influential architectural, engineering and design communities of Saudi Arabia, Bahrain, Kuwait and Qatar. 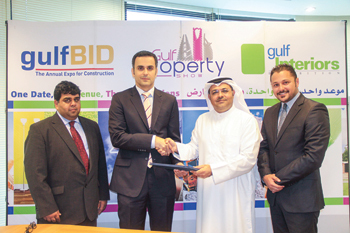 gulfBID, alongside Gulf Property Show and gulfInteriors, is backed by the Bahrain Property Developers’ Association (BaPDA) and the Middle East Facilities Management Association (Mefma).